1. Three vectors as shown in the figure below. What is the resultant vectors. V1x = (V1)(cos 30o) = (30)(0.5√3) = 15√3. Positive because this vector component points along the positive x axis (rightward). V1y = (V1)(sin 30o) = (30)(0.5) = 15. Positive because this vector component points along the positive y axis (upward). V2x = (V2)(cos 30o) = (30)(0.5√3) = -15√3. Negative because this vector component points along the negative x axis (leftward). V2y = (V2)(sin 30o) = (30)(0.5) = 15. Positive because this vector component points along the positive y axis (upward). V3x = (V3)(cos 0o) = (40)(1) = 40. Positive because this vector component points along the positive x axis (rightward). 2. Two forces perpendicular each other, F1 = 12 N and F2 = 5 N. What is the resultant of both forces. 5. 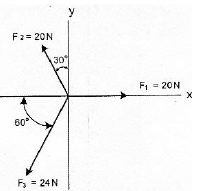 Two forces, F1 = 15 N and F2 = 9 N. The angle between both vectors is 60°. What is the resultant of vectors. 6. What is the resultant of three vectors as shown in the figure below?